What a delightful historic video I found today on YouTube. User Ishexan edited this from old film footage featuring the Finnish Horse - also known as the Finnish Universal or Finnish Trotter or Finnhorse. These are all-round horses, Cob-like in build, strong enough for draft work, fast enough at the trot for good racing, and also used for riding, including jumping. They are most commonly chestnut with a flaxen mane and tail, though other colors occur, including silver dapple (silver bay). There is a breed site in English here. Before motor vehicles it was not uncommon for boats to be towed through canals by mules or draft horses, which walked along a towpath adjacent to the canal. In many places, where the canals are no longer used except for pleasure, the towpaths have become pedestrian walks or bicycle paths. In Britain an organization exists to preserve the tradition of horseboating - that is, towing a boat along a canal with a draft horse. The Horseboating Society brings their horseboats to fairs and events, and performs long-distance trips, with the aim of maintaining access to the canals and of educating the public about this traditional form of transportation. It sounds like a pleasant way to see the country! The link above has lots of photos, and detailed information about the history and tradition of horseboating. 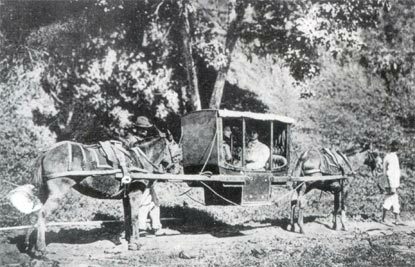 In past centuries in Brazil (and other places, too) wealthy ladies sometimes traveled by litter - that is, by a sort of miniature carriage without wheels, which was carried by men or mules. These were used when roads were not passable by wheeled vehicle and protected the woman from prying eyes and the exertions and dirt of travel, which were put upon the men or beasts of burden instead. This particular type, which caught my eye at an exhibition at a museum in São Paulo, Brazil, is carried by two mules, which are led by two men. It appears to me to be a rather awkward form of transportation, but interesting nonetheless. The image is from 1900. The original image, and images of other types of litters, can be found at the Museu Histórico Nacional. The description there says that litters were used in Brazil in the 17th century, to transport government officials and later, in the 18th, and even up until the 20th centuries, were a means to carry women as well as men. 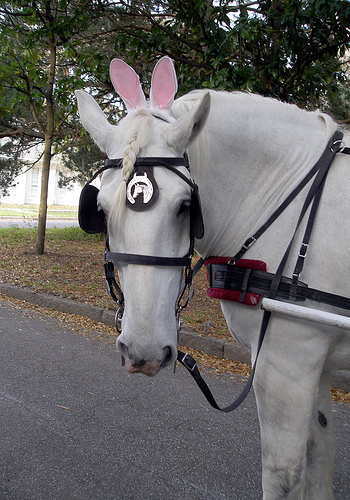 In town, they were usually carried by slaves, but for longer distances the mule-borne version was much more practical. The National Museum of Coaches, in Portugal, has some beautiful examples of fancy European litters in their collection. This one is a particularly ornate mule-borne type of litter. I saw the sweetest scene in a film the other night. PBS is showing a three part series called Windsor Castle: A Royal Year. In episode 2 there are some scenes of the famous Windsor Greys (the horses that pull the royal coaches) in training. But the cutest thing was at Christmas, when the castle staff sang Christmas carols. Not only did they go and sing a few for the Queen, they also stopped by the stables and sang "Away in a Manger" to the Queen's horses. The horses seemed to enjoy it! The series is available on DVD. Ever hear of the Central Park Massacre of 1883? Apparently the carriage drivers of New York City were quite annoyed by the introduction of the new and strange bicycle, and often took pleasure in trying to run them off the road. One gentleman in particular hit a breaking point on spring day and started shooting bicyclists...from the top of his coach! Read more about this and other bicycle vs. carriage mayhem in this brief article from Time Out magazine. There does not appear to be a translation available online anywhere, although there is a partial translation on the Kentucky Horse Park's site, here. Reportedly several people have followed this method as an experiment, and had great success. Thus various folks now offer translations for sale, suggesting this ancient system of interval training might be just the thing for today's eventing, endurance and race horses. "One of the finest working stables in existence, the Royal Mews at Buckingham Palace provides a unique opportunity for visitors to see the work of the Royal Household department that provides road transport for The Queen and members of the Royal Family by both horse-drawn carriage and motor car. 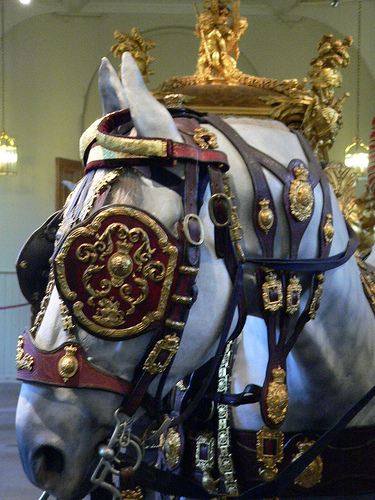 This golden bridle is part of the harness for the Gold State Coach mentioned above,which can be seen in the background. Check out the photostream on flickr for more photos. 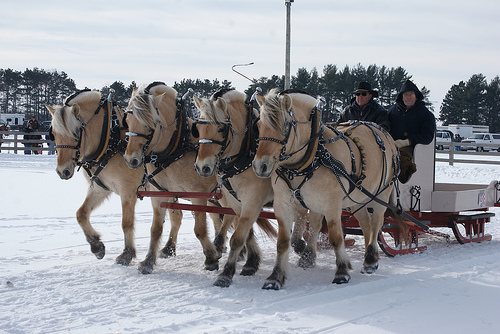 What a sweet photo of four Fjord ponies pulling a sled in Canada. Fjords are a stocky draft-type horse (or pony - they are short in stature, but due to their strength are often referred to as horses). Their distinctive dorsal stripe is traditionally shown off by trimming the mane to stand up, so the black stripe is clearly visible. Originating in Norway, the Fjord is now quite popular throughout the US and Europe, both as a driving or draft animal and for pleasure riding. 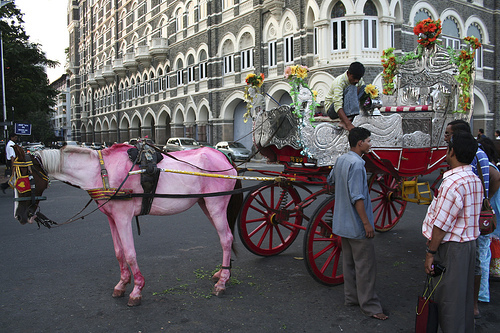 This carriage horse in India has been painted pink! The carriage looks ready for a wedding procession, so I assume the horse has been dyed for this special occasion. It's the least of his worries, given his undernourished appearance. I have seen Indian and Native American horses painted with small designs on the legs, shoulders, or other parts, but never dyed pink from neck to tail! A selection of unusual and interesting books and dvds to keep you entertained and informed. Support this blog by making your purchases through my store!